Why did Jesus allow himself to be beaten and tortured, it was all for YOU.. By the curse of Adam we are all sinners and all are mortal. 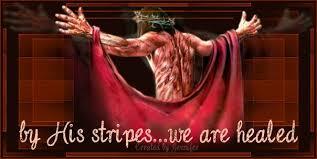 But by the Stripes of Jesus Christ we are now healed and redeemed to live forever. Amazing the Prophet Isaiah predicted Jesus would do this 700 years before he was even born. God knew that we couldn’t save ourselves so he sent his only begotten Son. Do you believe that Jesus is your Messiah? If so by his stripes you are healed and will have everlasting life. Jesus loves you so much he took your sins and washed them away so you are worthy to stand before God in his Kingdom. He bore Our sins, Jesus was sinless. The lamb was slain for our transgressions. How much more love do you need to believe? This entry was posted in Advent, Anxiety, Ash, Bible, Christianity, Cross, Enemy, faith, God, Health, Jesus, Religion, Wellness and tagged Advent, Bible, Blog, Christianity, Devotional, God, Health, Jesus, Religion, Wellness on February 19, 2015 by Unashamed of Jesus.